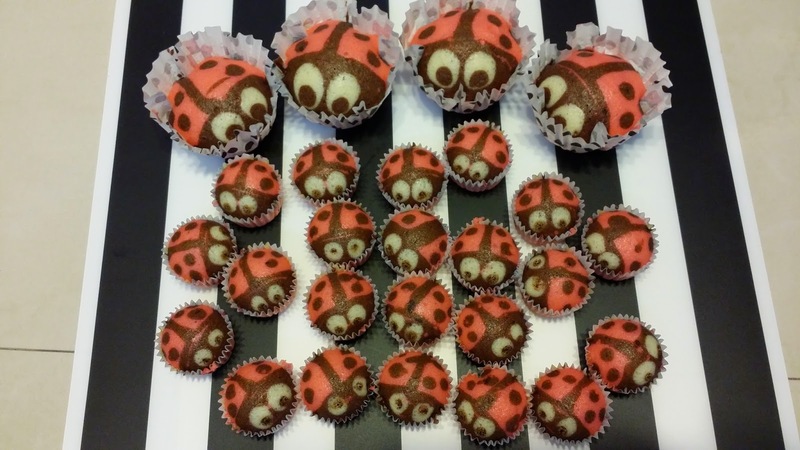 Miss CoCo Eats II: Super cute ladybug steamed cakes! 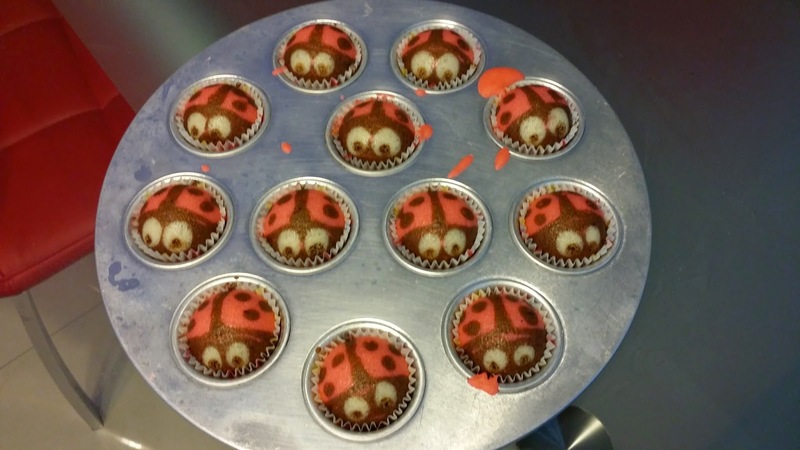 Super cute ladybug steamed cakes! I 1st saw this cake on a YouTube video, but it didn't post the details of the recipe, so I couldn't try it out. Interestingly a few months later a friend posted it on Facebook but still I didn't try it out. Last week another friend made it and posted it on Facebook, this time with a weblink to the recipe! This is perfect timing because my girl would be having her last day in K1 and I wanted to make something for her class to enjoy. Put eggs, condensed milk, sugar and vanilla in a mixing bowl and beat with medium high speed for 6 minutes or until ribbon stage. Sift flour and baking powder together. Alternate folding half of the flour mixture and milk into the egg mixture. Take 1 tbsp plain mixture and put into a piping bag. 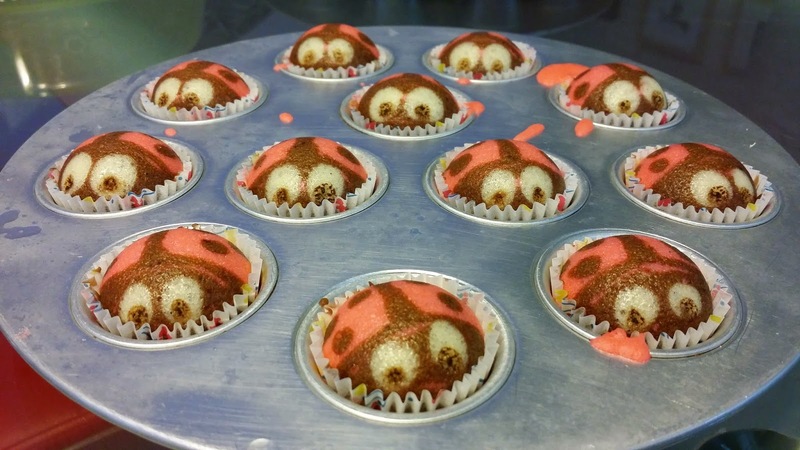 Take 3 tbsp plain mixture, mix with 1.5 tsp cocoa powder and put into piping bag. Colour the rest of the mixing with bright red and filled into a piping bag. Pump the red into a paper cup about 80% full. Draw a cross with the brown mixture and do dots on both sides. Colour the upper half of the cross brown and make 2 plain dots for the eye and fill the inside with the plain mixture. Steam with medium high heat. 12 minutes for full sized cupcakes and 6 minutes for mini cupcakes. I have a giant steamer, but my muffin tins is rectangular so it doesn't fit into the steamer. 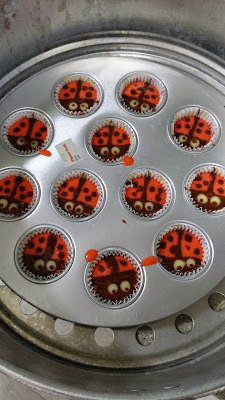 So I had to use my mini cupcake moulds. Even before steaming, they looked really cute already! Hope they turned out well! Oh my gosh can you imagine my delight when I opened the lid of my steamer after 6 minutes! A bunch of mini lady bugs looking at me! So cute! I couldn't stop taking pictures of them! So cute! The fact that they are small made it even more cute! My girl loved it! 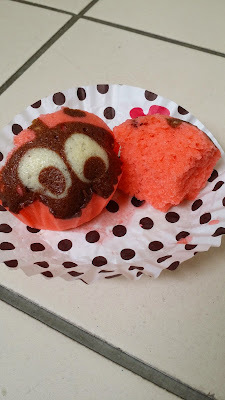 I made 2 batch of mini cakes and there's still some batter left, so I tried to make bigger ones. Unfortunately I didn't have the proper cupcake casing, so the big ones were a little out of shape. But put them together and the result was another round of squealing and "aaaawwwwww soooo cute!!!" They were like a class of little ladybugs and teacher ladybugs, so it was perfect for the occasion! OK, have to regain composure to continue.. The insides were quite nice and fluffy, but taste wise, it was quite ordinary. Like 鸡蛋糕. Maybe next time I make strawberry flavoured ones. The cakes were a hit! 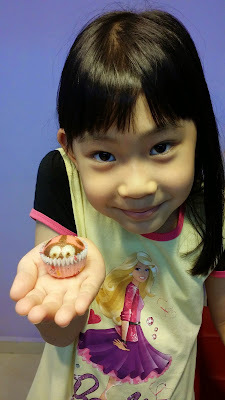 At assembly the classmates gathered around my girl excitedly and exclaimed how cute the cakes were. My girl said that everybody loved it and I assumed it made her a very popular person that day. I was glad everybody had a good time and good memories for the last day of school. I am glad you made some slight adjustment to this cupcake. I am going to try it your way.